I have tried to install Mac OS 9 on 1,5 GHz mac mini without succes. It eyects CD after happy finder and floppy disk statrs to blink. You need to tell us what cd image you used and btw since when does a mac mini have a floppy drive ? I hope you downloaded the modified OS9 version from here because otherwise it wont work at all. Is you CD possible bad or your burner? hrm, first happy mac but then the ? floppy symbol, i see that from time to time on my machines when booting from HD. but the kind of errors which can cause this normally should not appear when booting from a CD. try resetting PRAM - just in case - and then boot from the v8 CD again. Did you by any chance mount the image and used drag and drop to create the CD? It's not bootable in that case. You would have to bless it again. Have you tried “option-booting” the machine with the V8 disk in? 1. Insert the V8 disk in machine, booted under OS X. 2. Shut the machine down. 3. Power up the machine with the disk still in... and hold down the option key. 4. Release the option key when the “available boot disks” are shown. If the V8 disk isn't offered as an available boot drive, possibly your V8 disk is N.G. If this doesn’t work for you, you may have to attempt the Open Firmware route. But if your V8 disk burn is good one, this option-boot routine should work for you. perhaps a newly downloaded and created V8 disk should be tried first? That Happy MacTron and floppy icon are put up by the early 68k environment. The disk starts working but then the early MacOS can’t mount it. You have a bad disk or a bad drive. Try burning at 1x speed. I am using one of those tiny lil cheapcheapcheap USB audio mixers with just one mic in and one stereo in: it's a McCRYPT MX.3BT (manual can still be found on www) with channel 2 set to "usb play" - that's all folks. I found my old eMac copy of Mac OS9. Right now I'm ripping the image onto my pc so. How can I make this disk image work on my Mac Mini G4 1.33ghz? What files or patches should I replace on my Mac OS9 disk image? Edit: I know the disk image exists on this site, but I want to do it the most 'legal' way possible. Legal? Changing their disc is probably already questionable, or illegal? Get the update image instead of the install disc and extract the room and the ATI drivers. I made a video to show what has to be transferred to make it work. I used the instant daw in the video but the procedure is the same. I suggest booting the eMac from the disc (hopefully 9.2.2!) and then installing over FireWire disk mode onto the mini’s drive. Then just replace the Mac OS ROM file with one from here. Good luck! Thanks to all especially ones trying to help via privat messages. It was corrupted data. I have downloaded and burned the CD on a Mac. And it works. Wow! This thread is quite a read-- it took me 4 days! Did anyone ever figure out the PMU and sound issues, or is this considered done? As mentioned earlier: any compatible USB sound device will do. I got a tiny M-Audio Transit for about 20bucks, the first version of the M-Box is also known to work. For a more sophisticated multi-channel mixer setup the Tascam FW devices (Firewire) are very affordable. They have an OS-9 driver, but of course may need some extra check for mechanical function (featuring motor faders). So, I finally thought of upgrading my mini's 40GB HDD (Fujitsu) with a 512GB SSD (Super Talent) and suddenly Mac OS 9 and Drive Setup (both 1.9.2 and 2.1) won't even see the "disk". I cannot get to even initialize or partition it, under OS 9. I also tried Hard Disk SpeedTools 3.6 (from an external FW disk) and same symptoms. - I tried making OS 9 see it on the mini by formatting the SSD on Tiger another 2 times, the first with "Install Mac OS 9 Drivers" selected and the second time not selected. Same results. - Just in case, I tried partitioning every partition with no more than 60 GB, but the drive is still not seen in OS 9 on the mini. When I format the SSD with the V8's install image (using OS X's "restore" on disk utility) and/or when I mount the image and drag, from OS X, the contents into another partition, when I "alt-boot", I see 1 OS 9 boot option appears (although nameless), but when booting from it, I get the same symptom I did as when I tried booting OS 9 on the mini from a 1TB LaCie FireWire external hard drive: a diskette icon with a question mark in it. The install image is the one called "Macintosh HD", by the way. I never used partition sizes greater than 192GB for OS 9. I also tried partitions lower than 128 GB. No use. OS9 on mini won't see the drive, and OS9 on mini won't boot if otherwise installed on the drive. The one thing I realized I did not try yet (on both my internal SSD and my external FW drive) is to use HFS as opposed to HFS+, which I'll attempt shortly, although I'm not optimistic about that working out. Other than that, considering the same drive works on another OS-9-equipped Mac, is to try another version of the hacked Mac OS ROM or, worse yet, try inspecting the ROM to see what's wrong (which I completely lack the skill to do as of now). I also wonder if maximum drive size could have anything to do with it. Or if it's because it is specifically a "Super Talent" drive. Jumper or selector "setting" set correctly to “Master” on your adapter / SSD “bridge”? I'll add a jumper there later tonight! Thanks for the idea! Whatever your previous installed drive’s jumper setting was… well, that’s it. Have fun with that hotter, faster performance! - I can't "alt-boot" anymore, as it locks up / freezes the Mac. This happens both when the SSD is completely empty (recently-formatted) and when I try "restoring an image" via Tiger's Disk Utility with both an image of Ross' v8 disc and of the "Macintosh HD" disc image that comes within, each to a different partition of the SSD (since I can't use the CD/DVD drive to boot into OS 9), and then I "alt-boot". I guess it could be that it tries to "see" the v8 CD I have inside the mini (or maybe even if it is empty? ), but failing because the CD/DVD drive is unavailable? Within OS X, the drive is now seen as "disk0" instead of "disk1", but I can't tell if that's because it was set to be "master", or if it defaulted to that because the CD/DVD drive isn't detected. Since Tiger (and Ubuntu) could use the SSD before I set the drive to "master", maybe the original problem I'm having with OS 9 is unrelated to jumper settings? Edit / Note: Setting the SSD into "Cable Select" mode makes it behave like it did when no jumpers were set ("slave"). I could be mistaken about “Master / Cable Select” jumper setting (memory fog from time to time) but did you check the original jumper setting on the drive that you removed from the mini for reference? I also seem to recall (there’s that fog again) installing one SSD… first into a Quicksilver (running OS 9.2.2) as a “slave” where it was partitioned & formatted (& also possibly installing the OS there as well) - before then changing the jumper setting to Master and placing it into a mini. Just removed an original Samsung 160GB HD from an open mini here and it has no jumpers on… and is thusly in “Master” mode. Could it be that your CD/DVD drive is not correctly re-installed? Check-check, double-check everything / ya know? And of course it could all be related to something else entirely. (i.e. “things” not adequately connected or re-seated, etc.) Also, re-check/review just exactly how Master setting jumper is to be set on that SSD… proper up/down and side-to-side orientation. AND your SSD is a "direct-connect" requiring NO adapter? Yup, a "direct-connect" IDE drive, no adapters used. My mini's previous drive had no jumpers on it. If I understand its surface label correctly, no jumpers = Master mode. According to that PDF I linked to, it's supposedly the opposite of my SSD drive (for which no jumpers = Slave mode). I made sure not to mistake which side of the drive should be facing up or down, and I also made sure the jumpers were properly put where they should be. I'll keep quadruple-checking everything, though. I wonder, however, regardless of jumper settings, why Mac OS X and GNU/Linux see and handle it just fine in either case/configuration. And why vanilla OS 9.2.2, on a G3 WallStreet laptop, does too. But seriously, I greatly appreciate your support, it helps me pull through the ordeal. I'll keep trying things on my end, and keep you posted. I accidentally got OS 9 booted on the mini... not from IDE/PATA, not from FW... BUT USB?! AND THAT TOO WITHOUT OPEN FIRMWARE MANUAL INPUTS?! WTF?! Did anyone else give this a shot?! Has this ever happened to anyone with OS 9, especially on the mini, and that too without any Open Firmware commands? Although, damn, USB 2 is SO much slower than FireWire 400, let alone IDE/PATA (HDD or SSD), it's not even funny. But it is... serviceable. Undoubtedly, directly attributable to that south-of-the-equator Coriolis effect!!! Will now have to attempt same, as time permits. and then hopefully format and then install V8 on that SSD? Impossible. No. What. It saw the drive. Also, while I'm overjoyed, it's still early to celebrate, as this thing is behaving like my FW drive, meaning it's able to have OS 9 installed on it, but fails to boot (by showing a diskette icon with a question mark, as opposed to showing a folder icon with both a question mark and a Mac OS logo trading places with one another, within said folder icon). Still, at least I can SEE the drive under OS 9 now!!!!!!!!!!! Also, the USB OS 9 boot has a little trick / explanation to it that I noticed. It will never show as an option during "option-boot" / "alt-boot", but it can be selected as an OS 9 startup disk, and it will work. It will also work when you try to boot OS 9 unsuccessfully (like when I try to boot OS 9 from my FW or internal SSD drives), because then it starts searching for other OS 9 sources for booting, and that's when it sees the USB drive and boots from it (and that's how I discovered this). While you need a "proxy" to select USB OS 9 as a Startup Disk once, from there on you never have to do it again, unless you change the default OS you'll boot into. Because then you have to redo this process. The v8 disc works just fine as said proxy. That Happy MacTron and floppy icon are put up by the early 68k environment. The disk starts working but then the early MacOS can’t mount it. I just tried using this as a cue to trying to understand the base problem, so I figured that, perhaps, trying to boot in a way that would be "very friendly" to very old Macs could help. 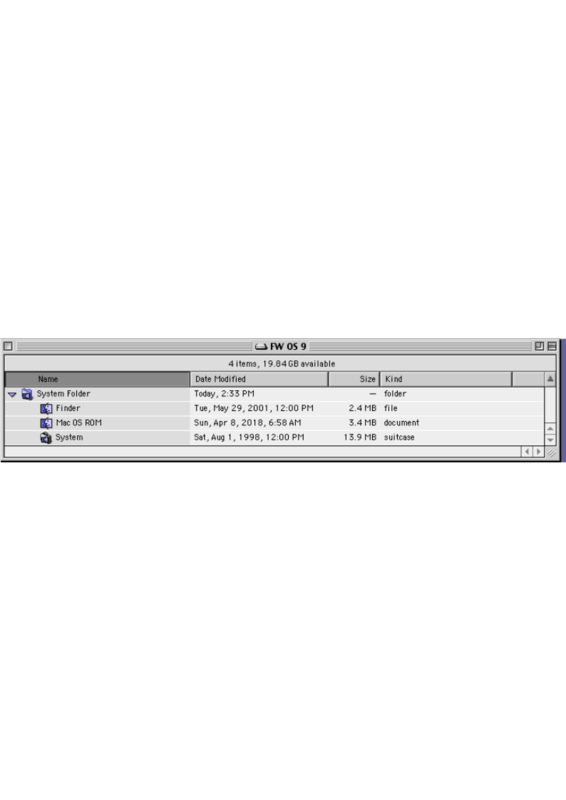 So I installed OS 9 on an HFS (non-HFS+) partition smaller than 2 GB (which once was the partition size limit for the original HFS on very old Macs). Alas, however, my innocent thinking had the same problem yield. EDIT: I noticed something kinda big/important: Drive Setup 1.9.2 only sees 128GB of my SSD, while Drive Setup 2.1 sees the whole 512GB. Can anyone else try seeing if this is also true on non-mini Macs, as well, for internal PATA / IDE drives that exceed 128GB? By the way, wasn't there some special adapter that could be used on G3 and some G4 Macs to bypass the hardware-related 128GB internal PATA / IDE limit? I know there was also a software-only solution, but that was for OS X only as far as I know, so an actual physical adapter that bypasses that would be interesting for me to try out. There is no USB-2 support in OS9, what you experienced was the fall back of the port to USB-1 speed settings. I never had trouble booting from USB media (and used it), but it's a true snail. Regarding the 128GB barrier: be careful. There are large drives that pretend to work, but they will start overwriting once anything is located beyond 128 GB. Iirc this applies to the boot drive, but not to 'non-blessed' disks, according to my faint memory. A 512GB PATA SSD is a rare object, they may use a special onboard controller. Since OS9 doesn't manage SSDs, leave at least 100GB unpartitioned as a spare region for internal drive management. USB 1 speed settings? The time it takes to boot certainly makes it feel like that, even though OS 9 called it "USB 2.1.1" (which can be seen on my earlier screenshot). A snail indeed. Still, first time I hear of this being a thing! Pretty cool. Thanks for the warning, though! It may save me in the future. 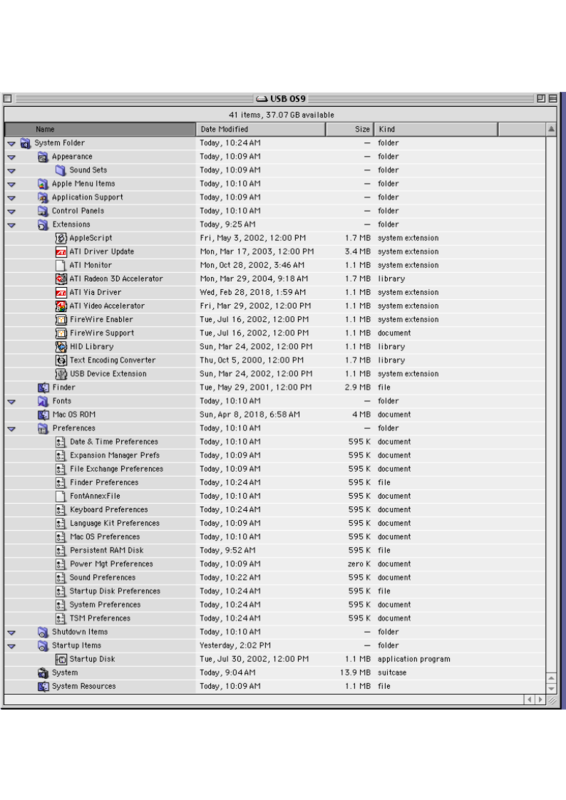 By not managing SSDs, you mean OS 9 lacks TRIM, right? If so, yeah, IIRC overall SSD manufacturers say to then leave between 10% to 20% of its maximum capacity unused (roughly 51GB to 102 GB in my case), with the % needing to be increasingly higher the higher the capacity (20% was needed for 2 TB drives IIRC, while between 10% to 15% would suffice for a 512GB drive like mine). However, I do remember clearly they state that, contrary to popular belief, you don't actually need to leave that data unpartitioned, as the drive does its internal management regardless of partitions (with the argument being along the lines of partitions having no relevancy on the drive firmware level, only higher). As long as the sum of unused space across all partitions (and unpartitioned space) matches the target %, it should be good. If I find the source for my statements, I'll post the link here. The latter bit I'm pretty sure was on Kingston's website, on some corner. tbh I don't know very much about the internals of SSD management, so it may well be that the drive doesn't care about where the blocks are located as long as enough are available. My concern about the drive's possible problems are based on my attempts to replace a PATA Zip drive in a Roland SP808 sampler by some flash storage medium. A journey that left me with 4 IDE storage bays and a dozen CF Cards of various size and type. Nothing ever worked except those PCMCIA cards that Cisco used in their network routers. Things under hood of ATA/IDE can be tricky and sometimes mysterious. What is the newest version of the G4-OS9-CD and is there a changelog? Will the sound-driver issue every be fixed, or do I have to use speakers with volumecontrol? The sound driver issues are unlikely to be fixed (not worth the effort writing for a rather humble hardware), but can be bypassed by installing the drivers of the M-Audio Transit USB interface. As reported by someone here this fixes the issues even without the Transit physically present. For audio, look no further than this post. Bought 3 of these (more for future minis or other computers), all real cheap, and they work perfectly. I think the mini is worth the effort (whether it takes months or years of effort), but that solely depends on each individual. As discussed elsewhere, I'd figure porting GNU/Linux, BSD or MorphOS (if the relevant bits were made available) drivers might be a way of doing it? But maybe tying all of it in with the rest of the Mac OS might be an obstacle? No idea. There is Mac OS X's / Darwin's source code available too, but people have looked into that to understand the job better, and it didn't seem it helped much, but I don't remember anymore. I, too, would say it's best not to expect it to happen (unless someone steps in to help ELN and the other OS 9 hackers out). But you can fully enjoy audio from the mini as it is today, as I have been. Playing music, or games like Escape Velocity, Diablo and Realmz, at full blast, both in terms of volume and overall system speed. The mini is delicious. This hack is a blessing. Will definitely get more minis in the foreseenable future. As for a CD changelog, yes, there is one: when you boot into OS 9 with it and then use the Apple Restore Software, before restoring, you can see a literal changelog in the top-right corner of the window. Mainly 9.2.2, the ultimate OS. Currently, I'm dealing with an issue with my 512GB SSD drive (big post on that coming later), but while I was using a 40GB HDD, I had 9.2.2 and 10.4.11 (client, not any of the 2 server versions). Right before I decided to use my SSD, though, I also tried installling both MorphOS 3.11 and Ubuntu Desktop 9.04, as well as some BSD variant, trying to see how I could accomplish the task of keeping them ALL installed in harmony and remaining bootable (while also being cautious of file-system-related issues we want to avoid, like the "Invalid Btree Header, 0, 0" error, but stopped after my 40GB HDD started presenting hardware problems (as expected of a refurbished, cheap HDD). I will tell you one thing, though: from as far as I have gotten, it seemed to me that, perhaps, MorphOS partitions may render all of the partitions of the same drive unrecognizable in OS 9. Don't quote me on that just yet, however, as I still plan to make it all work out. But I thought I'd let you know, so you'd be careful about expectations, since it doesn't seem like you installed OS 9 and MorphOS together yet. This is not an issue, however, if you install OS 9 on an external drive (USB or FireWire, presumably if its capacity is 128GB or lower), naturally. Not sure if MorphOS can be installed on USB drives (I think it can't, right? ), but on FireWire it certainly can't, as that system lacks FireWire drivers (even though it's a feature repeatedly requested since 2011, if not even earlier). Thx, but it's not about getting no audio, it's about controlling the volume on my lacie usb-speakers. I do not get OS9 or either MorphOS installed on a USB-Device, neither one will boot from USB-Stick. So I am currently using Tiger again, but I will make a new run on getting a tripple-boot working. I noticed something kinda big/important: Drive Setup 1.9.2 only sees 128GB of my SSD, while Drive Setup 2.1 sees the whole 512GB. Can anyone else try seeing if this is also true on non-mini Macs, as well, for internal PATA / IDE drives that exceed 128GB? ...Apple Drive Setup V2.1 that will be needed to format and partition drives greater than 128GB. We also recommend that you keep your partitions to sizes of 190GB or less or OS 9 will not boot and Norton Speed Disk V6.03 will not be able to defrag it. To clarify, if you are putting a 500GB in you Mac, simply break it into 3 partitions of 120GB for the OS, 190GB, and 190GB (format all volumes Mac OS Extended). It was December 2017 (!) when I ordered it (it took many months to arrive, and when it did, I was minding other things entirely). Back then, I was completely unaware of mSATA technology, let alone how much better and cheaper it is compared to SSDs, and that mSATA-to-IDE adapters were both a thing and very accessible. It blew my mind when I found out about that route! Would have been definitely a lot better in every regard I can think of. But now I have this drive on my hands... so I'd better make good use of it. And ah, yes, now I remember I had read that long ago on the website, and then 100% forgot about it, only to rediscover that later. It's just that rereading this thread recently and seeing how much smack 2.1 got for lacking FireWire support (the drive size bit wasn't at all brought up, IIRC), it made me think the information was new. But of course, I should have known better. Ah, I see. In that case, yeah, other than getting different speakers that adjust volume just fine with the mini, then indeed having the sound issue patched would be the only way. You can boot OS 9 on the mini with a USB stick just fine, though. The easiest & simplest way is to first boot OS 9 via any means (i.e. v8 CD), then run Startup Disk, and select the USB device. It will boot from it every time sucessfully. I hear Open Firmware is also an option, but never tried it myself. And there's also one other way of doing it, but it's quite underhanded: try booting OS 9 from a device that has it installed, but can't boot OS 9 from it, so that it shows the "question mark on floppy" icon. If OS 9 is not to be found anywhere else, but on a USB device, it will find it and boot from it successfully. If you format your USB device with HFS+ with Tiger/Leopard (and select to install OS 9 drivers), you can then boot into OS 9 via the v8 disc and use it to install OS 9 on it. Just ignore Drive Setup. THX, I'll try this. I think I did already generate hfs+ on USB stick and ignored drive-setup. My v6 CD installs on that stick, but I do not get it available during boot (pressing alt key). and this does not work for a Morphos Install. Yeah, "alt-boot" doesn't work for USB (unless you use the last boot trick I mentioned). I was using that guide, too. It's the reason I used specifically version 9.04 of Ubuntu Desktop, to play around with things. It's a pity if MorphOS indeed can't be installed with 9. If it truly doesn't work, perhaps that could be reported to the MorphOS team, although I wouldn't expect anything out of it, considering even getting FireWire to work wasn't enough incentive for them. By the way, that's the 1.42 GHz 32 VRAM mini, as opposed to the 1.5 GHz 64 VRAM one, according to that OS 9 screenshot. I have several Minis. Currently I downgraded to 1,25Ghz because it is much more silent, then 1,42 and 1,5 especial. I have partioned with Tiger and now I'll install OS9 first. Then Tiger and then Morphos. There must be a way to get all of them installed on the local harddisk and choose from "alt-boot". Argh, I forgot, I have to use OS9 for partitioning in order to get OS9 installed....OK, 4 Partitions, on first OS9. OS9 makes some strange thing to the partition table. DH1 is not the problem, but DH0 (64MB) exist two times and can not be changed. (now I could choose either OS9 or OSX and use the OS9 Partition from Tiger for classic if I would like to, but I don't. 3. I installed Morphos. And there was this strange thing with the 64MB Boot-Partition, but I got over it. Changing nothing, forward and then backwards in the iwizard and it installs without any issue. BUT after that I see all three OSes when pressing and holding alt-key, booting is only from Tiger and Morphos, OS9 does not boot anymore. Don't know why, because it was the first install and is far from what morphos does it's magic to the partition table. So it's as it is. Either OSX/OS9 or OSX/MORPHOS nothing more is possible. I believe those "strange things" are driver partitions for OS 9. This old NetBSD guide contains a bunch of interesting information for this and other things. If I learn of anything that can be of use to the OS 9 + MorphOS quest, I'll make sure to share it with everyone. Partition table looks good to me. Throughout the whole post, I assume the boot issue I have both with the IDE device and the external FireWire drive is that their capacity is past 128 GB, regardless of how you partition them, and that the same issue would be present with USB devices past that capacity, as well. I'll refer to the >128GB devices as "Big Drives" and to the <=128GB devices as "Small Drives". - An external, USB/FW Small Drive to help you boot into the external Big Drive (tested with USB, connected to a 40GB HDD with an IDE-to-USB Sabrent device). The solution to boot from an internal Big Drive was simple: fail to boot OS 9 from another, external big drive that contains a valid OS 9 installation with the modified Mac mini ROM, and that your only other available drive containing an OS 9 installation is your internal Big Drive. It will boot every time, after the "blinking question mark on diskette" icon flashes the question mark around 10 or so times. There's an exception to this, however: you cannot "alt-boot" into the external big drive. It has to be the default drive when powering on, or when restarting. You accomplish this by selecting it on Startup Disk. Just once is enough: if you don't switch away from OS 9, you don't need to touch Startup Disk ever again. Else you repeat the exploit to switch back to OS 9 as default. There's also another tidbit: it's preferable to boot from USB/FW than CD, because, speed aside, when you reboot after selecting your external Big Drive, you have to remove the CD beforehand, and you can't do this if you are booted from it. Removing it right before rebooting makes the exploit not work, and keeping the CD boots into the CD. If you remove it that way, you have to forcibly shut down the mini and restart (then the exploit works, because the external Big Drive is still pre-selected). If your external Big Drive is FW like mine and not USB, you have to unplug and plug back the FireWire cable onto the drive (or reconnect power supply on the mini) so that the FireWire device activates and can be mounted again (booting into OS X also reactives it, IIRC, but that takes longer). Turning the mini off and on is not enough. You can replug when the mini is off or on, eitherway works. But it has to be done. If your Small Drive is FireWire, you can alt-boot into it, to then select an external Big Drive to boot from with Startup Disk, for the exploit. Disconnect the FW Small Drive when screen goes black, else it may boot from it instead your internal Big Drive. If your Small Drive is USB, and your external Big Drive is FW, you can alt-boot into your FW Big Drive, which will fail, but then it will boot from the USB device. Reconnect your FW Big Drive and reboot (no need for StartUp Disk). Disconnect the USB Small Drive after screen goes black, else it may boot from it instead your internal Big Drive. If your Small Drive is USB and so is your Big Drive, then your only choice is to boot into the Small Drive from Open Firmware, or to boot from CD (slow, noisy, wears off laser lens, and a greater pain to use the exploit with). That concludes the how-to. Now here's some explanation as to why this even works, and some weird things I noticed. When OS 9 fails to boot from a partition with a valid Mac mini OS 9 installation, it already loaded parts of the modified ROM (perhaps even whole), and perhaps also a few other components, into the RAM. Booting fails mid-way for whatever reason, and it starts searching for other devices in the device tree for one with a valid OS 9 installation to boot from (it's another matter whether all devices are listed or not in the device tree). With the internal drive having a Mac mini OS 9 installation and none other, it boots from there with absolutely zero problems. The moment I had discovered the ROM, in part or total, is loaded from the first device and that it persists was when I had tried to stick an older modified ROM in the external FireWire device, while the internal SSD drive had the most current modified ROM. The older ROM still used the original Happy Mac logo, while the newest one uses a more colorful, modified one. When it booted from the internal SSD, it showed instead the original Happy Mac icon, which only existed in the FireWire drive (which is by that point unmounted and not even spinning anymore). But it didn't stop there: the old ROM reported itself not a G4 Cube, but instead a QuickSilver 2002 Mac, and that is what it showed in the Apple System Profiler ("Power Mac G4" as opposed to "Power Mac G4 Cube"). It is mysterious to me why 2 drives that can't boot Mac OS 9 by themselves can boot OS 9 when they work together. By the way, trying to use the same trick to get OS 9 to boot from my external FW Big Drive didn't work, but I'm not sure if my FW drive had been formatted with Drive Setup in OS 9 or Disk Utility in Tiger (if the latter, I certainly put OS 9 drivers in it, however). Any file further removed, and the exploit won't work. Any file further removed, and there will be a problem. - The extensions HID library and USB Device Extension are necessary to prevent error messages that slow you down from popping up after you boot. I think I covered all that I know on this matter. In conclusion, even booting from USB 1.1 became crazy fast. For obvious reasons. xternal firewrie drives can be attached to a mac other that mini and then you can partition it as you like in 10.4 (including os9 drivers). but of course once you have already put a 500 gb ssd in a mini you dont want to go that route. What file system are you running under morphos? Sfs has some limitations. Sfs got about the same start partition limits as os9. You might overwrite something once you install morphos after os9. Did you try it the other way around? I have to start with OS9, since then it makes no difference if I install Morphos or MacOSX second. Morphos iWizard Partition-Manager has issues with the small "Boot" Partition of Morphos. Hi guys, new member, first post. I joined up because I was looking for something cool to do with my Mac mini G4. I have been through most of the 12 pages in this thread and have done the easy install of V8 on to my mini. I can appreciate all the hard work everyone has put into this, it was a huge project. I am pretty new to Macs, all though I do have 2 (3,1) 8 core mac pros, the G4 mini and a PowerMac G4 MDD. I have just had bad luck trying to get any of the macs I bought to actually work, but I do have the 2 newly added Mac Pros working, 1 with El Capitan and windows 10 on the other. Anyway to the reason I actually am posting in the thread here. I was wondering why the output on the headphone jack was fixed to such a low level? I did read another post about someone wanting the built in speaker to work, but I do agree that it was unnecessary to get the built in speaker funtioning when most people would attach a set of speakers. I use a mixer to pick up the analog signal and I have noticed I have to turn the level up full on the channel its connected to, to be able to hear anything. Having said that, with it turned up so high its so low you can barely hear it. Is it a possibility to be able to unlock the volume slider so we can turn it up? Again, I want to let you all know I do appreciate the work that has been done, and I don't want to come off as a jerk, asking for changes to be made. If its not possible, I will have to settle for what it is. Thanks again. But there is no solution anyway, so save the effort and just install the M-Audio Transit software, regardless if you have that USB interface or not. For obscure reason it's said to fix soundmanager (I didn't try because I bought a Transit for $20). The software is downloadable, free anspd installs in 10 minutes. Ok Thanks for the info. Unsure what you mean by telling me to read another 12 pages though. I just meant that this thread I am commenting on is 12 pages long and that I think I am up to speed on this particular project. Well as much as I can be with my limited experience. I would have expected that if this was a problem with no way of fixing it, there would have been a mention of it on the download page with all the other notes. Or if M-Audio fixes the issue, it could have been added to the V8? I made the assumption that the sound was intentionally limited by the guys that coded this version of the OS. I am happy to try M-Audio, will I find it in the download section of this forum? Another problem I found with my mini is that if I let it sit until it wants to sleep, its gives me the message that it can't and the mouse is frozen. If I turn on the sleep replacement that was included with this version, then it won't wake from it sleeping. Not sure if thats something others are experiencing, but I thought I would let you know. Hello again, Just wanted to report that I found M-Audio usb driver for the Transit. As far as I can tell, it has had no effect on sound manager. Thanks for the tip. Don't understand that. You installed a M-Audio-USB-Driver but do not use the M-Audio-Device? Yes, to install the Transit software was once (not too long ago) posted by a user here as a working remedy for the OS9 soundmanager failure on a Mini G4. It may not work in every case, as XR-Lane just wrote. Sad, but guessing from my own experience with OS9 sound (before I had a Transit interface) not that surprising either. I got it kind of working (using an external line amplifier) but results flipped from great to plain failure in a very unpredictable way. Sidenote: I'm not interested in any system/entertainment/multi-media sound and didn't spend a single minute on such topics. Bias Peak, SonicWorx, Tokyo and similiar apps are my only interest in OS9 audio. I assumed you may gave missed some points (possibly mentioned in other threads). The Mini G4 was never intended to run OS9 software. Never. That smart folks of this board got it running is one of the greatest hacks ever, but it remains... a hack. To have OS9 boot at all, the soundmanager needs (at least) a dummy device to not break the startup process. It was clear that this fake woudn't work, but a possible fix might be applied later. It's not a simple fix because hardware isn't documented and one would have to reverse engineer the software from OSX test results. I never measured the G4 specs, but onboard audio from that time NEVER was great. There's a wide variety of audio interfaces (2nd hand) with OS9 drivers, up to Tascam FW mixers featuring motor faders for $200. ALL these devices perform much better than the built in G4 audio hardware and for that reason it's a waste of time to rebuild the missing OS9 part. Ok, your perspective are audio-apps that are os9 only. My perspective are games that are os9 only. but USB and Firewire Devices with no hardware-volume-control do fail too in g4-os9. So choosing something wich is good, cheap and small for both (OS9/OSX) is the target for me. The way you are putting it, you seem to be underestimating how OS-9-compatible the mini really is. The hack isn't such that it's putting together some frankenstein monster, but rather, for the most part, it was "simply" getting past errors that halted the boot process. Although the ROM is hacked (and nothing else-- it's literally just that one file), Mac mini OS 9.2.2 behaves and works as expected of any OS 9.2.2 machine that we all know and love. In the end, the hardware is so compatible, it's as if it was intended to be an OS 9 machine all along. And it very well could have been. But politics arose, as by 2005 Apple not only wanted people to forget about OS 9, they were even migrating from PowerPC to Intel. By the way, maybe I missed something, but I was confused about you bringing up that "Transit driver" audio fix, because I don't remember seeing mention of that in this thread's previous pages as a potential fix for the built-in audio. Was it a fix for one of the G4 laptops? The only real fix I have seen, and that does fix the problem, is to use a separate USB audio adapter, and appropriate speakers (I went for "medium quality" ones, as opposed to cheap ones that had a lot of noise in the middle, which is what I initially had). before actually installing and using this Transit… (soon?). so it seems that there’s no real hurry to test it. Anyways, thanks for the further comments regarding the sound issues. I, myself was hoping to use this as a os9 game machine as I never used os9 growing up. I just want to experience something I missed out on so to speak. I am not put off, I may try to source a usb device I can plug in for sound. Its still a great project, hope a fix is worked out someday. Sorry, me again. I did find a thread talking about 3 USB sound devices that did not work on the mini. I hate to be "that guy" but does anyone know what USB audio devices are working with the os9 mini project? The poster wrote that the presence of the drivers prevented the crash when setting a checkbox in sound control, so I assumed the panel and sound would work after that. But he actually did NOT confirm operation - sorry for my confusing info. This is an USB adapter for audio rather than a "USB audio device", but this is what you are looking for. I bought them. They were cheap. They worked flawlessly. You just cannot go wrong with this. In advance, I wish you happy gaming. If you need gaming suggestions, I have them. If you want to look further, there's Macintosh Garden dot org, Vintage Apple Mac dot com and others. Games are by far the kind of software I run the most under Mac OS 9. All emulation options are, by far, not as good, and the Mac mini fills the gap better than no other Mac computer IMHO. Random feedback, to everyone: when I used the Quicksilver-2002-based modified ROM for the Mac mini, I noticed the "freezing mouse" bug was completely gone. More precisely, what happened was that during boot, the mouse would freeze, but also unfreeze as soon as the system fully finished booting. Each time. The original purpose behind trying out that ROM back when ELN compiled it was to precisely fix the freezing mouse issue, and it looks like it did. It was switched back to the G4 Cube, because Ross reported he had sound issues he didn't have before. In any case, that's something for us to keep in mind for later. Also, for anyone interested in MorphOS, I wish to report I had the same problem with my internal SSD under it and, unlike with OS 9's case, I have no solution for it, roundabout or not. If it's anything like the symptom I had with OS 9, the problem may go away if I don't boot from CD, but instead USB, which, for MorphOS, has to be done with OF. So maybe I can install it that way. But even if I do install it if it shows up then, it's still no guarantee it will actually boot from my drive. It’ll be a little while before I can revisit this issue, but I suspect that it is a straightforward fix. Jubadub, can you do a few (dozen) reboots to confirm your findings? Sure, absolutely no problem. Is there some extra, specific instruction/procedure I should follow, or something specific to look for or confirm? As for my findings, I think I literally rebooted the mini around 70+ times over the past week and, actually, there's a bit more to the things I wrote down here (for instance, USB booting becomes more of a headache if I connect it not directly to the mini's USB port, but to a USB hub). But overall, as far as I could tell, it is exactly as I laid it all down here. What I can say 100% for sure though is that when booting from my 1TB FW device with a valid install, it fails, the FW drive gets unmounted, but whatever was loaded from it into the RAM remains there (parts of the ROM or whole ROM), and then it "borrows" the rest of the necessary data for a complete boot from another valid install location, such as the internal IDE SSD 512 GB drive or even the USB drive (I later tested things with a 16GB USB Flash Drive, as well, and had the exact same results). But sometimes that isn't enough to boot depending on specific conditions, such as whether or not a CD was already inserted beforehand (it seems to have the effect of "hiding" my IDE drive if it is scanned before the other devices), or if I try to boot from the FireWire partition using "alt-boot" (case in which, the trick, for some reason, doesn't work for the internal drive). Since I don't know the inner workings of what is really going on, it's all weird to me, but the results are quite consistent. Well diagnosed. The Mac OS ROM file brings the machine from Open Firmware to something resembling a freshly booted Power Mac 6100/7100/8100. The PowerPC NanoKernel and the 68k emulator run their initialisation code, resulting in an environment resembling a freshly-booted late-model Quadra. Then the 68k ROM image is executed (specifically a procedure called StartInit), and it brings up the high-level MacOS environment. (At some point this environment makes special called back up into the emulator and kernel to run PowerPC code and even preemptive MTasks.) Importantly, StartInit repeats the whole 68k boot process, including finding a drive with a System Folder. well if it is really so easy then i´ll buy two. Yeah thanks for that, cheap and easy. I will pick one up soon and try it out. I wouldn't mind some suggestions, but may be a little off topic in here. If you want to send me a message, that should work. What I can say 100% for sure though is that when booting from my 1TB FW device with a valid install, it fails, the FW drive gets unmounted, but whatever was loaded from it into the RAM remains there (parts of the ROM or whole ROM), and then it "borrows" the rest of the necessary data for a complete boot from another valid install location, such as the internal IDE SSD 512 GB drive or even the USB drive (I later tested things with a 16GB USB Flash Drive, as well, and had the exact same results). Shot in the dark. Does this file help with the FireWire problem you describe? It removes a single optimisation that can prevent the FireWire driver from being loaded in early boot. "The FireWire problem" I describe, as in, not being able to boot from FireWire? Well, I just tried out the ROM, and booting from FireWire didn't happen. And I was still able to exploit its lack of bootability to get it to boot my internal 512 GB SSD instead, like before. So this ROM file worked just like the one found in the v8 disc, for me, meaning there was no difference that I could tell. By the way, just for me to be sure I don't confuse anyone, the only way I can currently boot into Mac OS 9 from my internal IDE SSD is to rely on the fact my FW drive can't boot into Mac OS 9, failing mid process, leaving some of the boot data behind in the RAM. The next boot device that is found "picks up" from that point on and finishes the boot (which, otherwise, by itself, it would not be able to do). Thanks for giving it a shot, though. I have been slowly inspecting all the reverse engineered files from your repos (even though I'm still trying to set up a build environment), and I found amazing just how many comments are left there by previous Apple employees. They really, REALLY help one understand what's going on, to a degree. I'm paying extra attention to the 68k ROM files because of StartInit.a, which you had mentioned, and which really looks like it should be the first place to look into, alongside perhaps StartBoot.a? Is there a possibility to change the Language or to make a own installation CD in another Language? I ask this for possible entry for my blog in German. Get the Mac OS ROM file from the mini install cd, and delete all the resources in it except for 'cfrg' resources. Copy into all the resources that aren't 'cfrg' from a Mac OS ROM file in the language you want. The other mini-specific files (I think just ATI drivers) can just be copied over (the file names can be changed if needed)., as they don't control major parts of the user interface. Anything I missed or got wrong? I am only somewhat involved in this particular project.